Bob and Leigh have worked as a duo for over 25 years with a large and varied repertoire, often performing in Leigh's hometown, New York City. Here's BlueBird at the Back Fence in Greenwich Village, NYC, where, for years, they regularly hosted a popular Open Mic for poets and musicians. A second incarnation of Jukebox Jamboree featured Leigh, Bob, George Roberts (drums) and Alan Allen (bass). Jukebox Jamboree played in the NY, NJ, area for several years before the band members moved on to other projects. 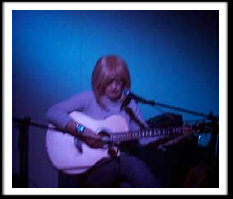 As Bob and Leigh travelled around the US, they performed at numerous clubs and cafes. Here there are, in late 1993, while performing at a party gig in Connecticut. other members of Jukebox Jamboree. 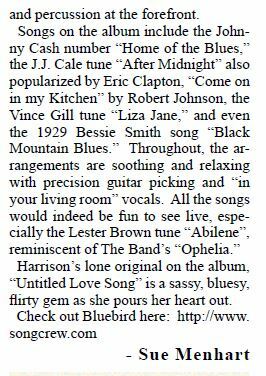 Below is the review that was published in the October 2018 issue of the noted CT music magazine, SoundWaves. 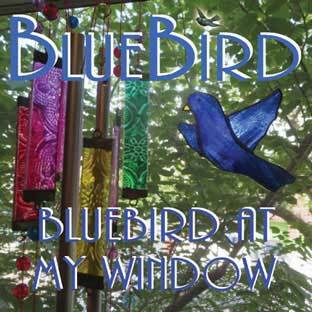 Bob & Leigh spent 2017 working in their studio, re-mixing and mastering tracks for BlueBird's first-ever CD, "BlueBird At My Window." 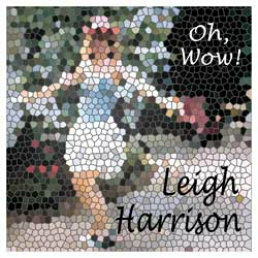 It includes 12 songs that have been Leigh's and Bob's favorites for many years, as well as one of Leigh's original songs. a bounce and vitality that make them worth sharing." We hope you'll enjoy the songs as much as we enjoy performing them! Click below to listen to Leigh sing "San Francisco Bay Blues," written in 1956 by Jesse Fuller, It's one of the tracks from the BlueBird CD.